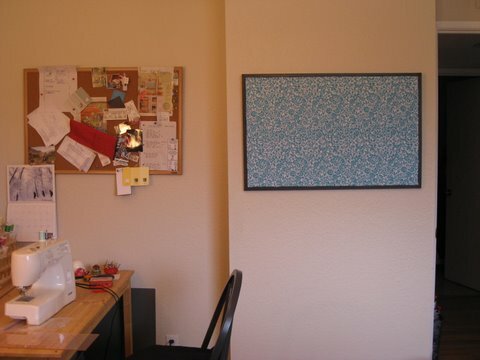 I bought a large bulletin board from Goodwill during the last 50% Off Saturday Sale. 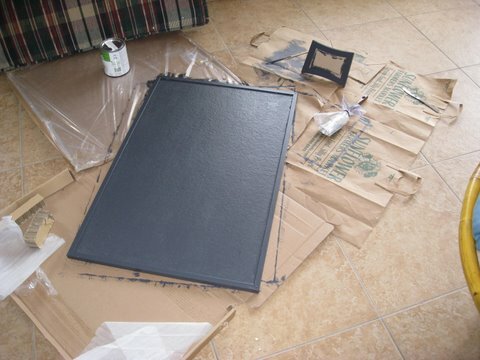 My original plan when looking for another bulletin board was to pull off the frame, paint the borders, and reattach the edges. 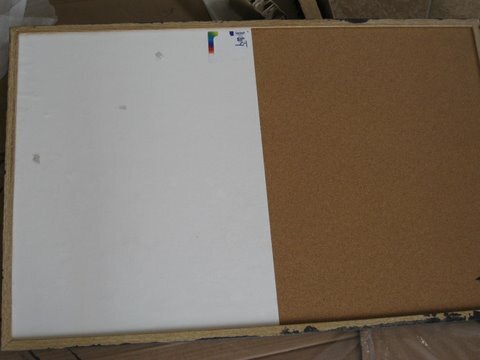 The only large one at the store that day was half bulletin/half whiteboard, and the pressed wood edges didn’t seem like they’d take kindly to being pulled off and reattached. I bought it anyway because at $3.50 the price was right. As I mulled it over, I realized the back would work with pushpins. I painted the whole thing with my favorite paint leftover from my dining chairs. (You can see one of the dining chairs in the bottom picture.) I didn’t even have to take it outside because I had left some cardboard trash by the back door for several days somebody was storing a cardboard box in the sun room and it was a great protective surface when flattened out, and the low VOCs paint didn’t fill the house with poisonous gases when painting indoors. 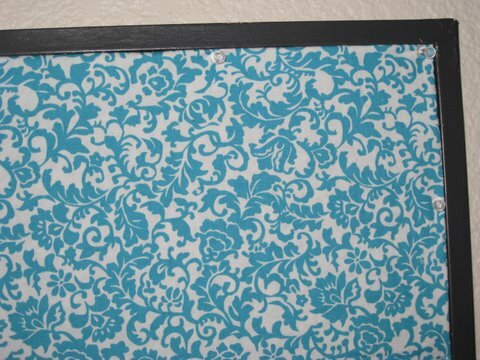 A piece of turquoise print fabric was the perfect size, thus validating my purchase of the fabric when I hadn’t had anything particular in mind for it at the time besides really liking the color. The fabric is attached with clear pushpins, which means I can change it with ease down the line. 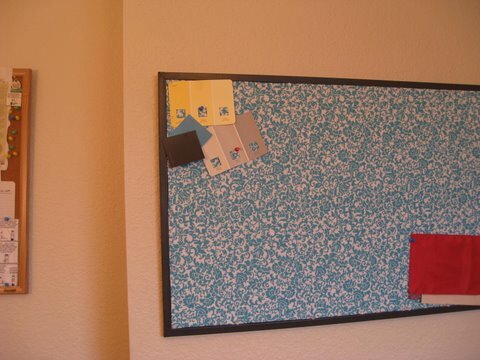 I might give the same treatment to the other bulletin board with a quieter fabric. February 21, 2010. Tags: completed project, fabric, refashion, sewing room. Pictures, Projects, Words. pretty thrifty/creative! what will go on it? February 22, 2010 at 6:25 am. Permalink. It’s great–love that fabric. You’re inspiring me. I’ve got my boys’ room covered in bulletin boards and they are well, sort of less cool looking than I thought they’d be. Maybe I’ll go cover them in fabric . . . . . hmmmmm. February 22, 2010 at 8:11 am. Permalink.